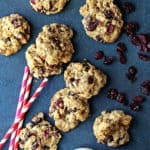 Dark Chocolate and Cranberry Oatmeal Cookies – These perfect chewy cookies are absolutely perfect for the holiday season or anytime year round!!! I love Naomi Robinson. 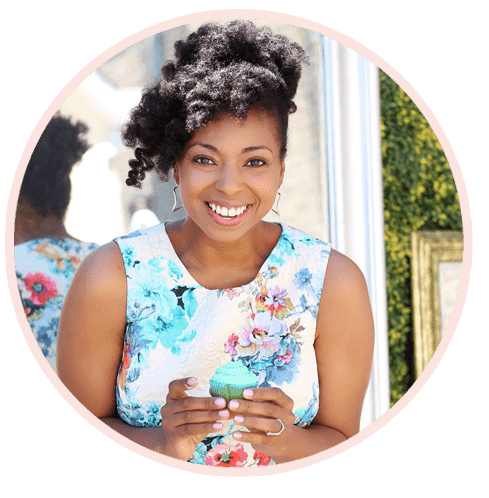 I have loved her brand and everything she has done for sweets bloggers since i first started blogging. 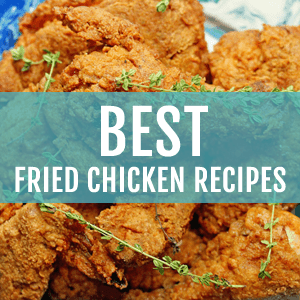 when i found out she was writing a cookbook, I think i squealed out loud. I was in a state of euphoria because I knew her work of art would be the ultimate! Absolutely incredible. And of course I was right. Naomi’s first cookbook Bakers Royale is legit peeps, and you need to get your hands on it. 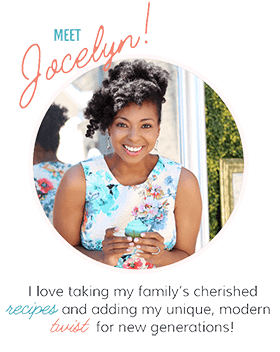 She features our absolute favorite desserts in the most creative and fun ways. 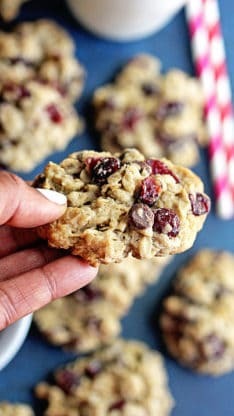 Her unique spin is placed on every single recipe including these Dark Chocolate and Cranberry Oatmeal Cookies I made just in time for the holiday season. Yep I said Dark Chocolate and Cranberry Oatmeal Cookies! YES! 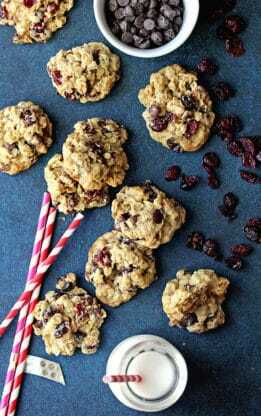 The hubby actually went through the cookbook and selected this recipe because he loves oatmeal cookies in all forms. This was sensational because the dark chocolate was such an incredible match for the cranberries. I’m so used to adding raisins so the cranberries were such a wonderful seasonable addition. The flavor of them was incredible. I also loved how chewy the cookies were with that nice tender bite from the oatmeal. They were simply perfect, and would make a wonderful gift for the holiday season. 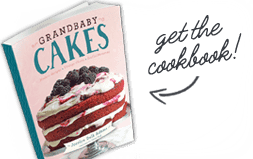 Package them up and send them to those you love, along with a copy of this wonderful cookbook so they can bake all fall and winter long. 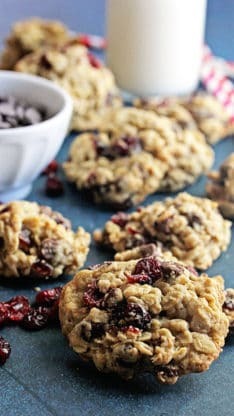 Dark Chocolate and Cranberry Oatmeal Cookies - These perfect chewy cookies are absolutely perfect for the holiday season or anytime year round!!! 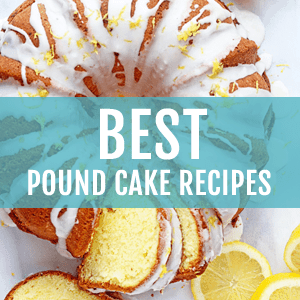 In a small bowl, whisk together the flour, baking soda, salt and cardamom. Set aside. In a medium saucepan over low heat, melt half of the butter (1/2 cup). Remove the pan from the heat and add the remaining butter to let the residual heat melt it. Add the brown sugar, granulated sugar, and vanilla, and whisk to combine. Add the eggs, 1 at a time, making sure the first one is fully combined before adding the next one. Add the wet ingredients to dry ingredients and stir just until combined. Fold in the oats, chocolate chips, and cranberries. Using a medium cookie scoop or a tablespoon, drop rounded tablespoons of dough onto the baking sheets, 2 inches/5 cm apart. Bake for 10 to 12 minutes, or until the cookies are golden brown. The cookies will be slightly underbaked at this point, but they will continue to bake as they cool on the baking sheet. Let the cookies cool for 5 minutes on the baking sheet before transferring to a wire rack to cool completely.